Baize - Dyed green or less commonly red, baize is a flannel-like cloth. Batik - Created by a distinctive dyeing process. Wax and other substances that resist dye are applied; after dyeing the wax is washed out to leave dramatic patterns. Bed skirt - Placed between the mattress and box spring – the bed skirt hangs to the floor on three sides of the bed. Also referred to as bed ruffle, valance or dust ruffle. Bedspread - A decorative, top of the bed cover, that covers the pillows and hangs to the floor. 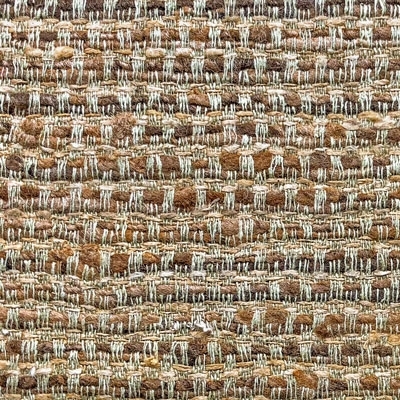 Boucle - Fabric with a curled or looped surface, usually of heavier weight, suitable for upholstery. Boudoir pillow - A small rectangular decorative pillow measuring 12” x 16”. Also referred to as a breakfast pillow. Brocade - Brocade is a fabric, originally made from silk, and generally reputed to have been developed to a high state of perfection in the 16th and 17th century in France, Italy, and Spain. However, it actually originated in China and Japan where silk was woven with real silver and gold threads. Motifs may be of flowers, foliage, scrollwork, pastoral scenes, or other design. Brocades, like all other textiles, were changed after the Industrial Revolution. The new brocades became available to more and more people as the price was reduced. New fibers were introduced. They were no longer solely woven of silk. Today, all silk brocades are difficult to find. And yet, a brocade remains easily distinguishable from other styles of woven textiles and still immensely popular. Anichini's brocade collection finds its historical roots in Italy, but also borrows from other cultures. Most of our brocades are updated versions of very old designs. 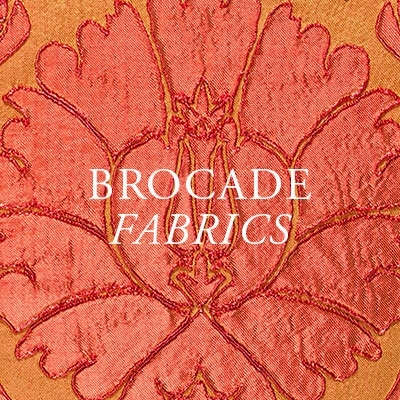 Brocade is often confused with its cousin, damask. Damask is usually reversible, brocade is not. And finally, brocade is usually woven with several colors while damask is not. Butter Muslin - A loose woven cotton. Continental sham - A decorative pillow covering, constructed with a flange or trim, which fits a large 26” x 26” pillow. These are often placed behind standard size pillow shams as a backdrop for all of the other pillows. Also referred to as a Euro sham or a European Square. Coverlet – A decorative, top of the bed cover that does not cover the pillows. Pillows are placed on top of the coverlet. 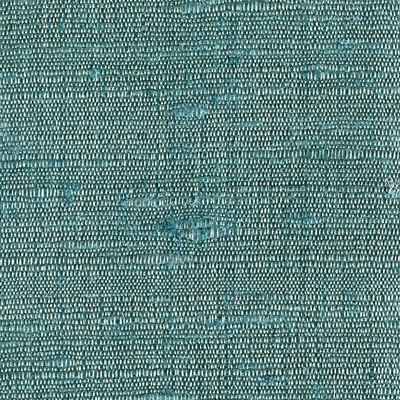 Cotton Lawn - A loose woven cotton, with a finish almost as smooth as silk. 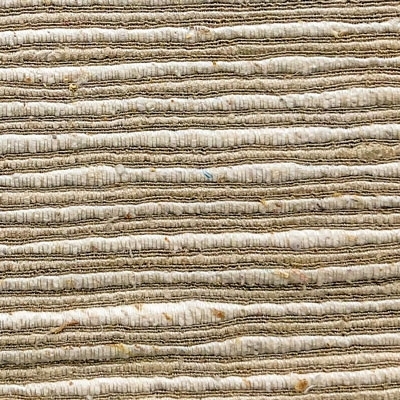 Calico - A plain-woven cream cotton. 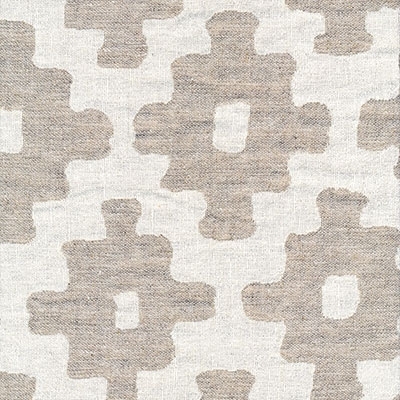 Canvas - A heavy woven linen and cotton mix. 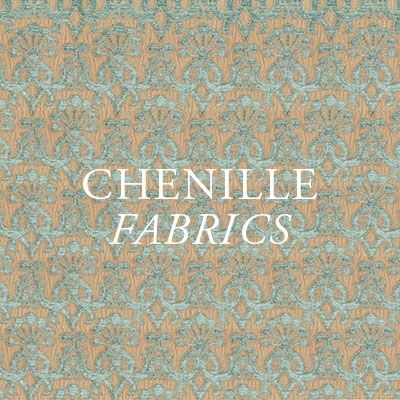 Chenille - A cloth of heavily textured cotton or synthetic having rather a fuzzy decorative pile. Seen in highly ornamental trimmings. Chintz - Chintzes are made from cotton finished with a shiny glaze. Originally floral chintzes were block-printed and glazed with waxes and starch to brighten the colours. 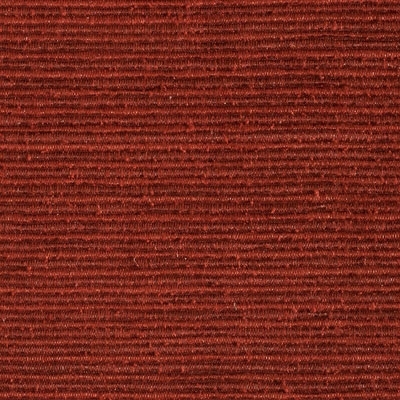 Corduroy - This hard-wearing cloth is usually made of cotton, but also of synthetic yarns, all with a cotton-backing cloth. 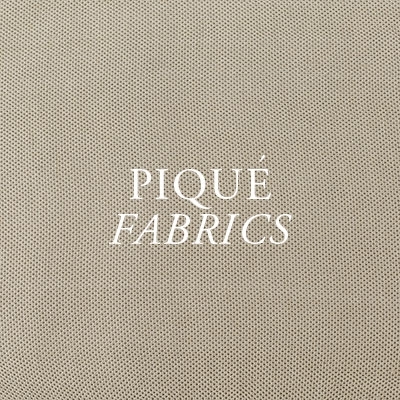 The cotton has cut-pile ribs, or cords, running down the length of the fabric which vary in width but are evenly spaced, Makes up well into curtains and upholstery giving a warm, comfortable feel. Interesting piping if texture is wanted. 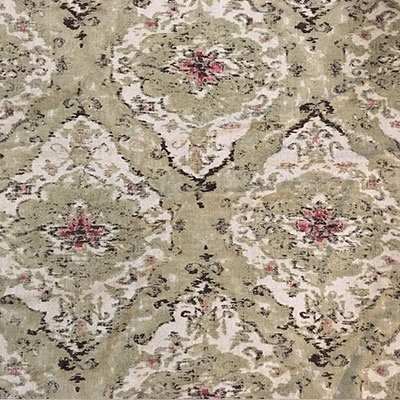 Damask - Cotton or silk damask is a highly traditional fabric, woven with large, abstract leaf and flower designs in contrasting matt and satin textures. Damask is also woven in wool and man-made mixtures. It is similar to brocade but is flatter and reversible. Dupion - Used to describe forms of real or artificial silk. Both have a distinctive slubbed surface. Dupioni silk - Dupioni comes from the Italian word doppio, or double and refers to the fact that this silk is produced using fibers from a double cocoon spun by two silk worms. It can take as many as 5,000 Dupioni cocoons to create one quilt. 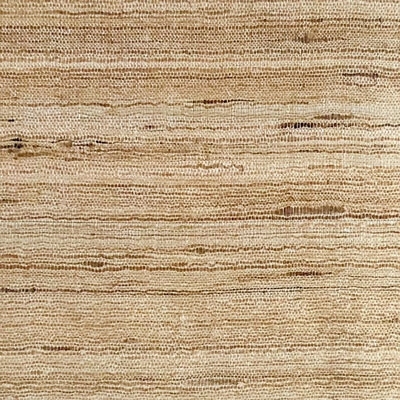 Characteristic of Dupioni silk are its imperfections or slubs - created by the variations in the threads – as a result no two pieces of Dupioni fabric are alike. Duvet Cover - A decorative cover for a fiber-filled duvet. Open on one end for easy removal it is a quick way to change the look of a room. Also called a comforter. Extended Coverlet - A decorative, top of the bed cover that covers the pillows. Gaufraged - The French word for embossing or stamping a pattern on cloth by means of heated rollers. Mostly done on velvet for upholstery. Avoid steam as the flattened design may disappear. Gingham - A checked cotton fabric. Gingham comes in a wide range of primary colours and check size. Usually made of pure cotton. Grosgrain - A cloth recognised by the pronounced ribbed effect across its surface. 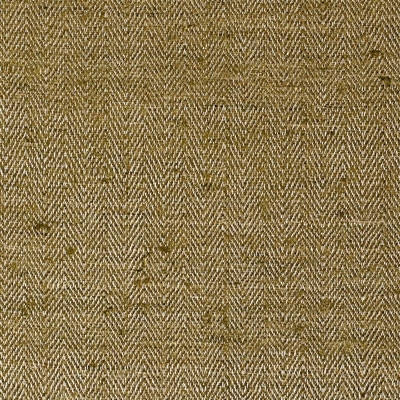 Holland - Medium weight cloth made from linen or cotton. Ideal for roller blinds as the non-fraying edges can be trimmed to any size. Ikat - Chinese silk fabric tie-dyed to create softly outlined patterns. Can also be made of cotton. Lace - An open work fabric, usually made of cotton. Designs are almost infinite, from tiny repeated floral motif to large-scale designs. Linen union - An inexpensive linen mixture. Linen - Woven of fibers from the flax plant, linen is renowned for its strength and durability. The ancient Egyptians were masterful linen weavers and many examples of their work have been found intact in the tombs of the Pharaohs. During the 8th century, the Emperor Charlemagne promoted the growing of flax and prided himself on his linen garments. Elegant and beautiful, linen table cloths and napkins last for generations. 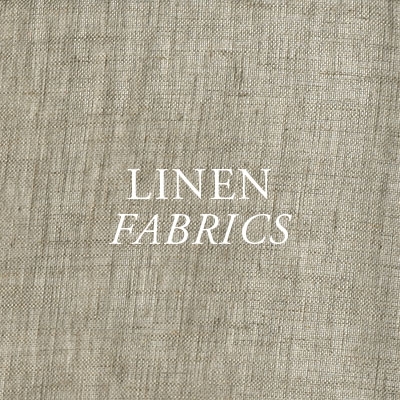 The natural wax content of flax fibers gives linen a beautiful luster. Linen becomes softer and finer the more it is washed. Matelassé - A French word meaning "padded or cushioned." 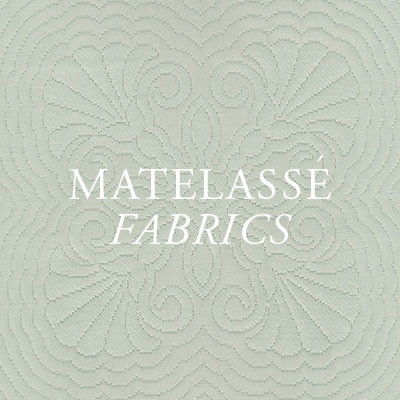 Created on a jacquard or dobby loom, matelasse is a double-cloth woven fabric. 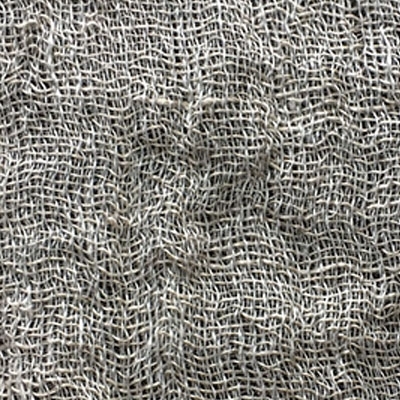 Crepe yarn used in the double weave shrinks during finishing causing a blistering effect. 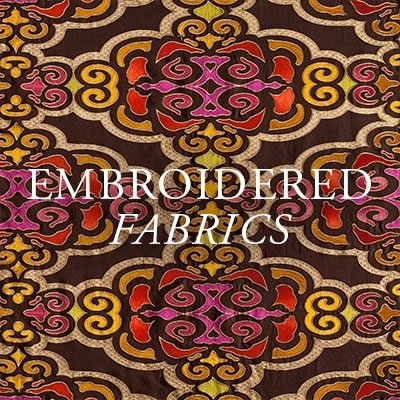 Because of this unique weave, the fabric pattern stands out, with an embossed look. Matelasse fabrics wear very well and make beautiful bed shams, coverlets, throws and bed skirts. Merino Wool - Has long been prized for its soft, silky texture. The fibers are much finer than traditional wool and about 1/6th the thickness of human hair. Wool fibers are cased in tiny, overlapping scales - making them water resistant. Because Merino wool fibers are so fine, the fabric does not itch and agitate the skin like traditional wool. Originating in Spain, the Merino sheep flocks were once strictly controlled by the King of Spain and sheep were exported only as rare royal gifts. The largest Merino wool flocks are now found in Australia. 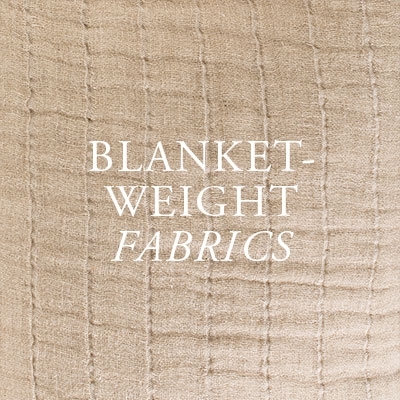 Anichini's soft, 100% Merino wool throws have reversible patterns and a beautiful, satiny finish. 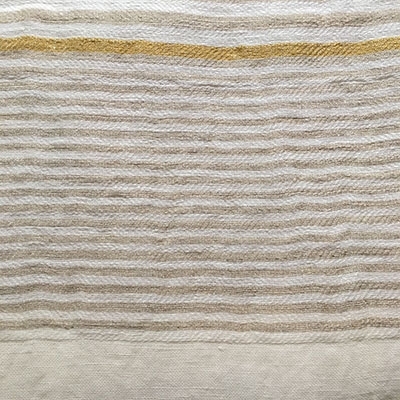 Muga silk - A rare, wild silk and naturally gold in color. Spun from the cocoons of silk moths that live in the forests of Assam - a small area in northeastern India - this prized silk was originally worn only by kings and nobility. Muga silk is renowned for its natural, spun-gold color, glossy texture and durability. The process to obtain the exquisite golden fiber the silkworms produce is extraordinary. Villagers gather the cocoons in the wild and cultivate the eggs of the moths that emerge. The silkworms are raised in the village and the silk is spun and woven on foot-powered, hand operated looms - producing a characteristically uneven fabric. For six hundred years, Muga silk was worn by the Ahom kings and noble families of Assam. “Muga” is the Assamese word for the rich golden color of the cocoon. The fabric was unknown to the outside world until 1662, when the French explorer Jean Joseph Tavernier traveled through Assam. Clothes made from Muga have been known to last for 50 years. Anichini is the first company to develop this fiber for the home. Madras cotton - This brightly-coloured fabric is imported from India,woven with checked or stripped designs. 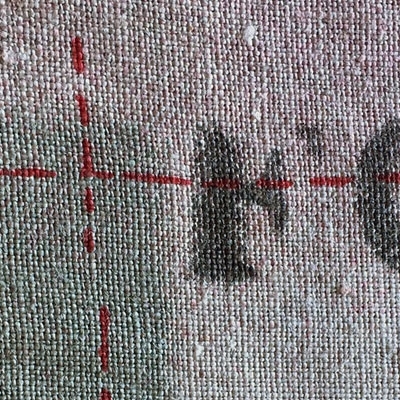 Moiré - A watermark effect on silk, a popular finish to man made silk imitations. Muslin lawn - A crisper and more finely woven version of butter muslin. Makes excellent translucent curtains. Ottoman - An increasingly sought-after cloth coming in many yarns - cotton, silk, and synthetic. It has a horizontal ribbed pattern and is suitable for upholstery as it is very hard wearing. Often to be found in stripes of different colours. Paisley - Fine woollen cloth printed with intricate scroll or pine designs. Plaid - A woollen cloth of check design. Pillowcase – A fabric cover, constructed with one end open. An American design used to keep a sleeping pillow clean. Also referred to as a pillow slip or pillow sack. Pillow sham – A decorative fabric cover for a pillow, usually constructed with a flange or trim. 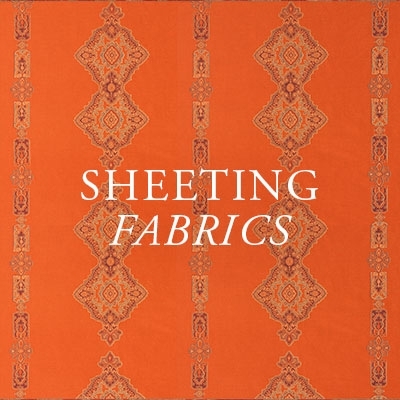 Pillow shams are a European design. Sateen - A weave usually associated with cotton fabrics. The mercerised yarns used give the cloth a smooth, almost shiny finish. Satin - A fabric made out of silk, cotton, or synthetic fibres. It is very smooth, soft and shiny with a matte reverse side, often in lush, sometimes deep colours. Care should be taken when using this fabric, as it tends to spot and be difficult to clean. 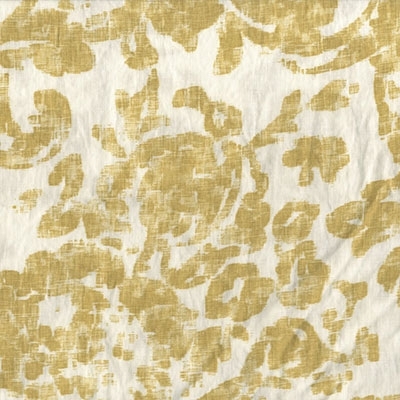 Shantung - Unevenly textured wild silk. Silk - Regarded as the most luxurious of all fabrics. Coming in many forms, from fine linings to upholstery weight, in prints and colours, silk is soft, strong and has an easily recognised character. Taffeta - A fine crisp silk, but comes in synthetics too. Many colours and smooth on both sides, usually with a sheen and sometimes "shot" in appearance, giving the effect that the fabric slightly changes colour and appearance according to how the light falls on it. 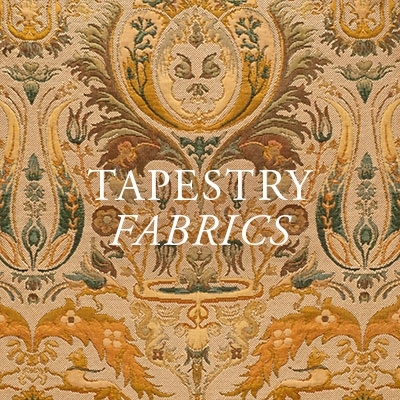 Tapestry - A heavy fabric made on a Jacquard loom, in imitation of hand-sewn tapestries. Tartan - A woollen cloth woven with a particular checked pattern of specific colours, each belonging to one of the Highland clans of Scotland. Ticking - A striped cotton material originally used for covering mattresses. Toile de Jouy - A cotton or line fabric printed with scenes of French pastoral life, traditionally in dark red on a cream background. Tussah silk - A wide silk typically a natural yellowy-brown colour as it is not easily dyed. Originally Indian. Tapestry - Tapestry is one of the oldest forms of woven textiles. The word tapestry is defined as 'a thick textile fabric in which colored weft threads are woven (originally by hand) into fixed warp threads to form pictures or designs. The earliest written records of woven cloth appear in the biblical text Exodus, Chapter 26, and it is reasonable to assume that the woven fabric referred to was a tapestry-type. Egyptian tomb paintings from circa 3000 BC clearly depict weavers working on a tapestry-type loom and vase illustrations by the Greeks dating back to circa 500 BC show women weavers working at looms. In medieval times, tapestries were one of the most important forms of artistic expression and were commissioned, particularly in the early middle ages, to depict religious scenes. Conditions in which the weavers worked were often cramped and poorly lit and a twelve-year apprenticeship had to be served before one could be regarded as a master weaver. Medieval weavers' guilds, which were male-dominated, prevented women doing anything other than spinning the yarns and so the term spinsters was created. 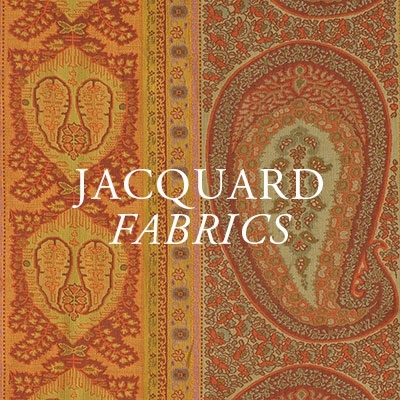 Today, modern, mechanized jacquard looms, using the same techniques as those used in centuries past, produce reproductions of traditional tapestries. They provide us all with the opportunity, in our own homes, to share in the beauty of magnificent tapestries at realistic prices. Anichini tapestries are very thick and rich in both design and the actual construction. The Gobelin weave (cross stitch) produces a very thick and authentic looking tapestry. Our tapestries are all produced in Italy in the last factory which can produce this quality. 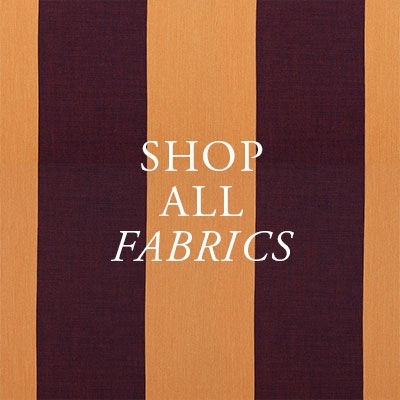 Anchini offers pillows, bolsters, bed coverlets, bedskirts, table rugs and table runners in tapestries. Velour - A fabric with a thick pile that lies in one direction, made of cotton, wool, or synthetic fibers. Best suited for heavy, warm-looking, lush draperies and curtains or tablecloths. 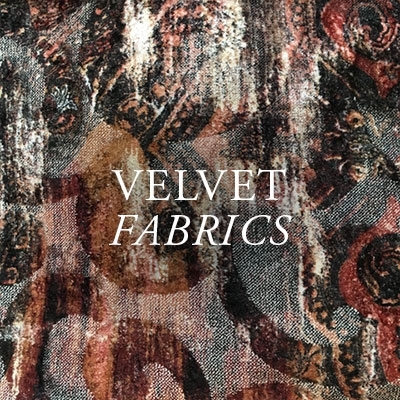 Velvet - A cotton fabric (more rarely silk, linen, mohair or wool) whose cut pile gives it a soft surface that absorbs light. vVoile - A white translucent fabric, ideally of cotton, to be used behind curtains or as a window dressing in its own right.